“Yikes! I ate way too much! I feel so bloated!” Ever hear a phrase like this after a big meal? When you rapidly consume large quantities of food, you also tend to swallow a great deal of air. For humans, feeling bloated is physically uncomfortable, but it’s also an inconvenience of our own making. Bloat in dogs, on the other hand, is a serious and dangerous medical condition that requires immediate treatment. Let’s look at dog bloat: What it is, how it arises, and what can be done to treat and prevent it. 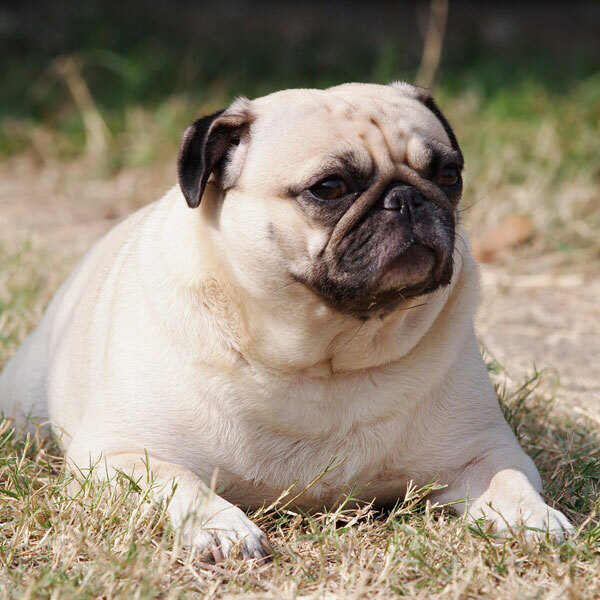 If I say “bloated dog,” chances are the first thing that pops into the layperson’s mind are images like the ones in this article — to wit, overweight or obese canines that resemble Jabba the Hutt. Bloat in dogs is an informal term that covers a pair of related but distinct digestive issues. The first of these is related to the holiday-meal scenario described above. Dogs, as we know, will eat anything they can wrap their jaws around, and as much as they can get. Eating too fast, whether you’re a human or a dog, causes aerophagia, literally, eating air. Dogs who belch after a hearty meal are better able to avoid the more serious sort of bloat. The second, far more dire form of dog bloat is called gastric dilatation volvulus, or GDV for short. Bloat in dogs that involves GDV is more complicated than an excess of gas, fluid, or food, because it comes with a horrifying twist. Quite literally, in cases of GDV, the stomach itself is twisted anywhere from 180 degrees to a full 360 degrees from its normal position in a dog’s abdomen. Not only are fluids, gasses, and food matter distending the stomach, but they are effectively trapped there. A twisted stomach allows nothing to escape, in or out. All avenues for relief — belching, flatulence, and defecation among them — are blocked, a situation that can be fatal if professional veterinary assistance is not sought immediately. Our research shows numbers ranging from 30 percent to 50 percent mortality rates for bloat in dogs accompanied by a twisted stomach. 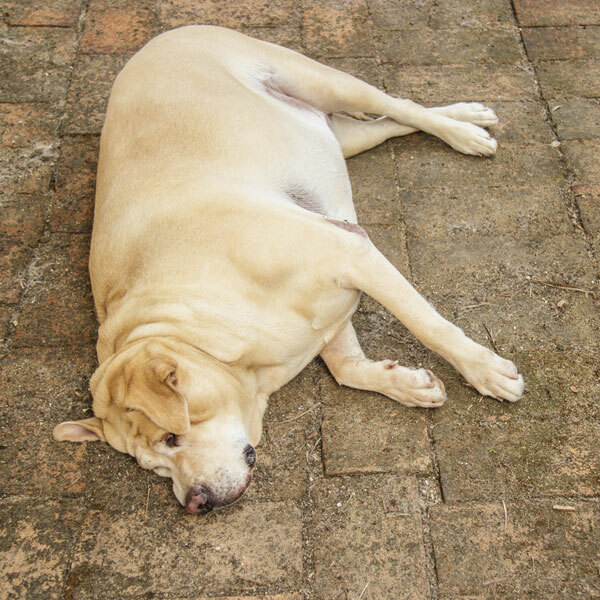 In milder cases of dog bloat, the causes are similar to those in humans. Dogs who eat too much, particularly when they eat quickly, can develop bloat, and the same is true for rapid overconsumption of water. Remember your mom telling you to wait 30 minutes after eating before going out to play? Strenuous activity or exertion, especially after a large or rapidly devoured meal, is another potential path to a bloated dog. Not only is GDV, bloat with a twisted stomach, more dangerous, it’s also less predictable. The reasons why the stomach twists, denying food, liquid and air any point of egress, remain unclear. The best we have are risk factors based on observed cases of bloat in dogs, who it affects and when. All breeds of dog may potentially fall prey to a twisted stomach and GDV, but larger dog breeds, along with those who have deep and narrow chest cavities, are the most frequent sufferers. Breeds that are prone to bloat include the Akita, Alaskan Malamute, Bernese Mountain Dog, Boxer, Briard, Bulldog, Cane Corso, Chow Chow, Great Dane, Greyhound, Irish Wolfhound, Komondor, Labrador Retriever, Leonberger, Mastiff, Newfoundland, Standard Poodle, Rottweiler, Saint Bernard, Samoyed and the Weimaraner. 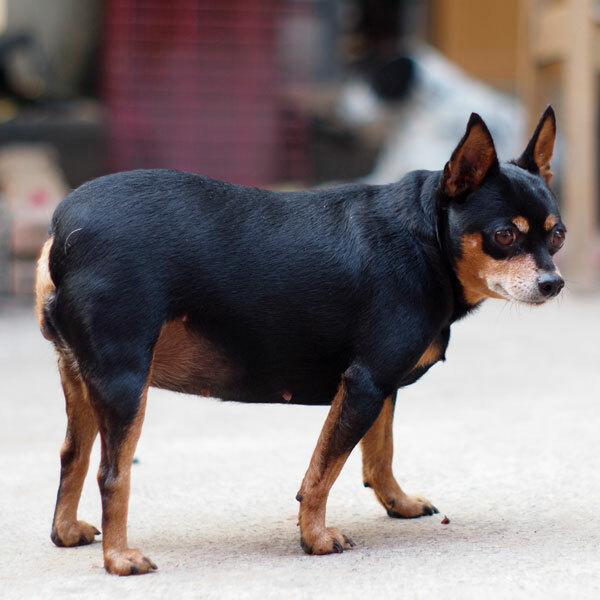 This severe type of bloat is also most common among adult and older dogs. 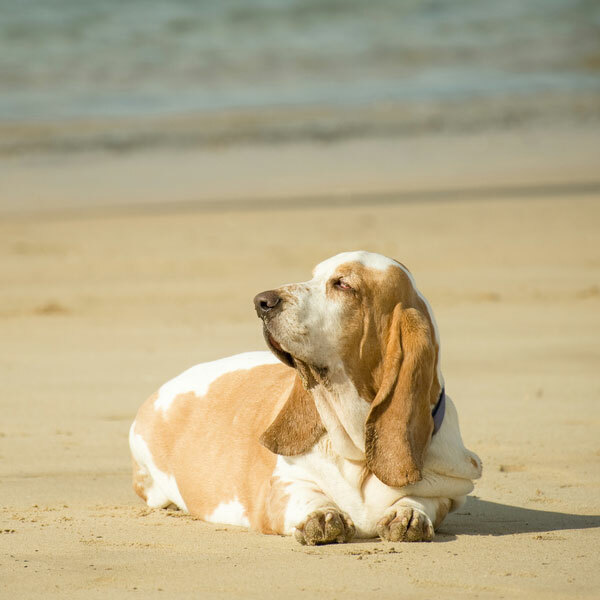 Symptoms of bloat in dogs range from the obvious, which is to say, an abnormally distended abdomen, to the strange, such as relentless and aimless pacing or walking around. Bloated dogs may also be seen trying to vomit with no positive results. That restless movement, if the case is growing worse or developing into GDV, may turn into listlessness, fatigue, and inaction. A further sign to watch out for, whether the dog won’t stop moving or won’t move at all, is labored breathing. As the bloat in dogs worsens, their heart may start racing and their gums turn pale. Any combination of these signs should send you and your pet scurrying to the nearest animal hospital. Treatment for bloat in dogs with GDV is risky and painful. If a bloated dog’s stomach is twisted, a veterinary surgeon must operate in order to restore function to the stomach at its entrance and exit points. Even if surgery is successful, a very high and troubling number of GDV cases recur, often necessitating another surgical procedure called gastropexy. This involves pinning the stomach to the wall of a dog’s abdomen so that is incapable of becoming twisted again. Some owners of dogs from high risk breeds have even wondered whether they should subject their pets to preemptive gastropexy to avoid twisted stomach altogether. Risky preemptive surgeries aside, how can we prevent our dogs from becoming bloated and possibly developing GDV? For owners of at-risk breeds, the first and simplest approach is smaller regular meals, and keeping their food and water dishes on the ground. Dogs who crane their necks to the ground to eat have less chance of ingesting excess air along with their meals. A second easy tactic is to keep human food and table scraps out of a dog’s food. Food that a dog is unaccustomed to, or which is high in carbohydrates, is more likely to produce gas, and too much gas can lead to bloat. Bloat in dogs, with or without a twisted stomach, is an uncomfortable, painful and serious condition. Monitor your dog’s diet and make sure that they exercise either before or well after they eat. Have you ever had to deal with standard dog bloat or had a dog with a twisted stomach? Please share your experiences with bloat in dogs in the comments below! 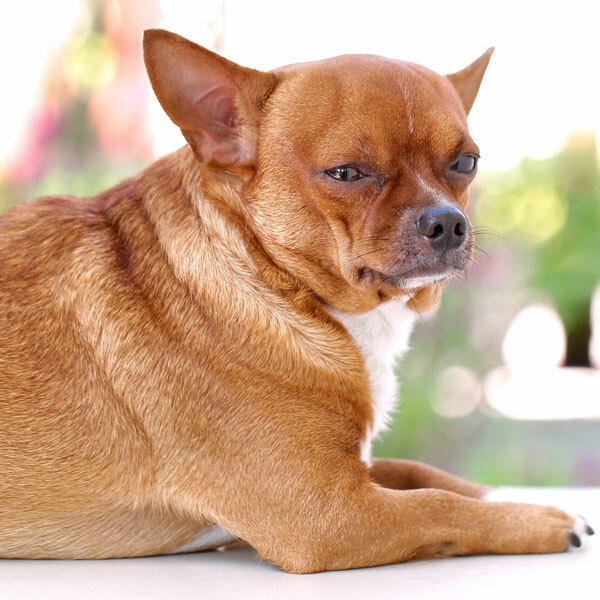 The post Don’t Get It Twisted: How to Prevent Bloat in Dogs appeared first on Dogster.